With high winds, sandy soil, and a spring season that seems to stay cold forever, Cape Cod provides unique challenges to the creative gardener. Then why do so many glorious gardens flourish here? C. L. Fornari has the answers. With 225 color photographs and an authoritative text, Cape Cod's own “Garden Lady” leads a tour from public parks to some of the most beautiful private properties. Along the way, she offers Cape Codders detailed advice on growing roses, hydrangeas, perennials, shrubs, vegetables, lavender, and so much more. 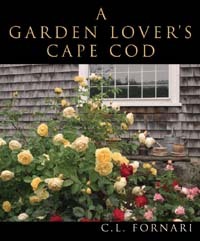 Chapter 2, “Cape Cod Treasures,” points out plantings visible from the roadside and private gardens open to the public. Chapter 3, “Over the Garden Gate,” takes the reader into private gardens she or he would never find alone. Chapter 4, “Cape Cod Garden Style,” sums it all up, explaining just what makes a quintessential Cape Cod garden. For the Cape gardener, Fornari's analysis, advice, and gorgeous photography will be an inspiration, and for anyone who loves Cape Cod this book will be a delightful tour of places where the beauty of the land matches the splendor of the sea.